Dr. Dean Betts was born in Mississauga, Ontario seven minutes after his twin brother Todd. While Todd focused on Business (his nickname was "APK" for Alex P. Keaton), Dean concentrated on the sciences aiming for a career in Dentistry (no known nickname - at least to him). As with most science undergraduates entering fourth year, Dean needed to find a project supervisor and was serendipitously introduced to Dr. Andy Watson, a new UWO faculty member at the time. During this time, which extended to a Masters, Dean discovered the fascinating worlds of embryology and research and is still mesmerized when seeing an early embryo. He changed his career aspirations from dentistry to research and never stops thinking of the next experiment. Dr. Dean Betts is currently an Associate Professor in the Department of Physiology & Pharmacology with a cross appointment in Obstetrics & Gynecology at the University of Western Ontario, London, Canada. He received degrees from the University of Western Ontario (BSc, MSc), and the University of Guelph (PhD). 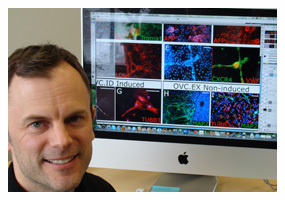 Following a post-doctoral fellowship in the Department of Genetics at Case Western Reserve University Dr. Betts joined the faculty at the Ontario Veterinary College in 2001 to study nuclear reprogramming events in somatic cell nuclear transfer clones - ironically genetically identical individuals as well. Dr. Betts' research, which has resulted in over 40 peer-reviewed publications, has focused on characterizing and understanding the molecular and cellular mechanisms of early mammalian development using cattle embryos as his main experimental model. 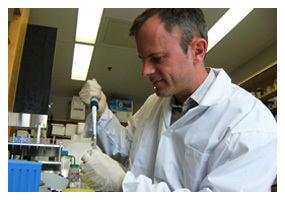 Notably, his studies on telomere length regulation presented evidence of a telomere-lengthening event during the first week of embryogenesis and that some healthy and fertile cloned animals and their offspring exhibit variant telomere lengths compared to their reproductively bred counterparts suggesting that epigenetic alterations could be passed through the germ line. Dr. Betts was one of the first to apply RNA interference technology to study gene function in bovine embryos. Using live cell imaging and embryo microinjections his lab revealed that the stress adaptor protein p66Shc is mechanistically involved in the ROS signaling, telomere-dependent pathway of permanent embryo arrest. Applying global gene expression analyses to stably transfected bovine cell lines, his research has discovered alternative function(s) for the catalytic subunit of telomerase (TERT) that changes the cell state towards a progenitor stem cell-like condition. This information explains the utility of ectopically expressed TERT as a potent reprogramming factor in the production of induced pluripotent stem cells (iPSCs). Just prior to Dr. Betts' move to the University of Western Ontario in 2008, his lab was one of the first groups to generate and characterize numerous canine embryonic stem cell lines and the first to isolate a mesenchymal stem cell population from umbilical cord blood of foals. These recent discoveries have led Dr. Betts to focus his research activities in developing clinically relevant animal models for stem cell - based transplantation therapies and to study various cell biological aspects of human embryonic stem cells and iPSCs. 1) What was one of your first jobs and what did you do? One of my first jobs in high school was at a professional photography store where I sold cameras and other photography equipment. No digital stuff back then - all film. I still have the single lens reflex camera I bought while working there. 2) Do you have any hobbies? My hobbies have slightly declined since the birth of my son (4 yrs old) and daughter (2 yrs old) but I would say traveling (especially back country camping - no car camping please), photography and any kind of sport (I still play ice hockey). 3) What was the last book you read for enjoyment? One of the last books I read was "The Beckoning Silence" by Joe Simpson, the same mountaineer and author of "Touching the Void". I love true-life adventure stories and got interested in mountaineering after I climbed the summit of Mount Kilimanjaro (before the kids were born). 4) What is your idea of the perfect "lazy day"? A perfect lazy day would be drinking a cup of really good coffee in the morning while reading the Globe & Mail; a bacon and eggs breakfast; watching a James Bond movie or two; a big Deli sandwich for lunch; playing some video games if I could get away with it (currently band in the house); watching a NFL football game; a nice medium filet mignon with mashed potatoes and a glass of Shiraz (food is important); and I would finish the day wrestling and playing with my kids. 5) Where would you like your next vacation to be? 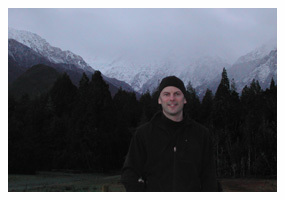 I think it will be in Argentina, but I do want to get to Nepal to climb the Everest Route with my brother.